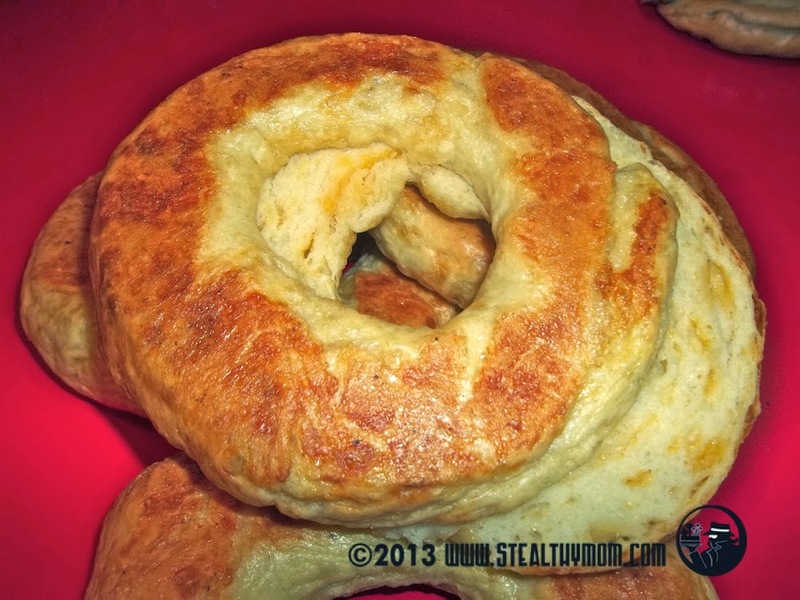 Bagels are easy to make, and a great project for the kids to help with in the kitchen. Twice this year, G-man has taken Garlic and Cheddar Mini-Bagels when it was his turn for preschool snacks. I based this recipe on one by John D Lee which turn out chewy on the outside and soft on the inside. The cheesy, garlicky variety are as great fresh from the oven as they are toasted the next day for breakfast. Yum. Turn the dough onto a floured board, and spread it out with your hands. Sprinkle the garlic and the cup of cheddar on top. Fold the dough over, and knead for five minutes, adding flour as needed. Bake the bagels for nine minutes, then turn them over and bake for another nine or ten minutes. If you are making minis, bake them for only eight minutes on each side. Allow them to cool at least fifteen minutes before you tear into them. I have never made bagels before, but these sound great and not crazy hard. I thought there must be a secret or something!